I had to learn how to photoshop pictures for my computers class, and one of the assignments was to superimpose one of my photos into a place have never been but would like to go to. 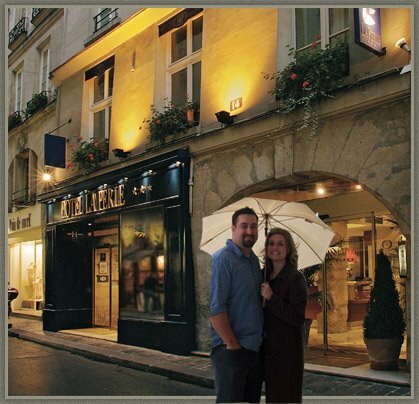 So I placed Nathan and me in Paris. It is kinda funny because we are holding an umbrella but it obviously is not raining. Honestly if the umbrella weren't there and you hadn't told me this was Photoshopped, I would probably have thought it was real at first glance. Nice job! I really want to take a class on Photoshop. I'd love to learn how to use it better. There are so many amazing things you can do! well, you never know, it could start any second! Photoshop is really a great program. I love using it! You both fit right in! Good Job !! It looks great and I wouldn't even have noticed. And yes, I do know one of the TAP OUT founders died. So sad.